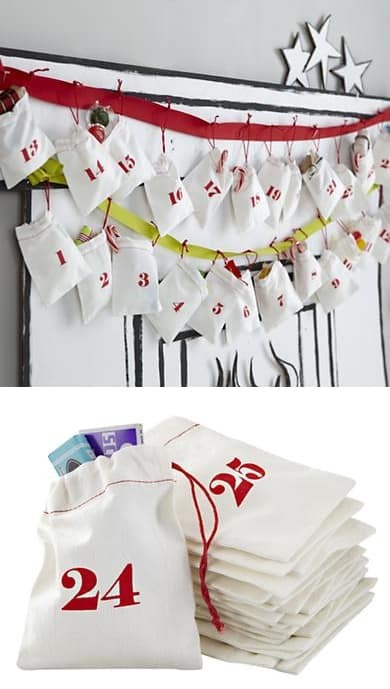 Looking for unique advent calendar ideas? 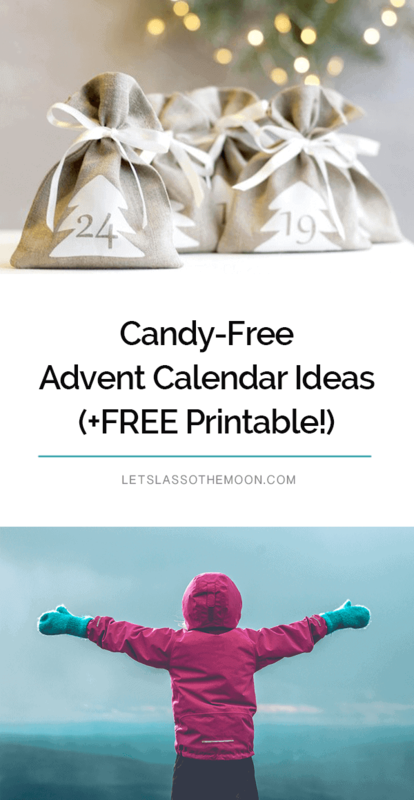 Skip the chocolate this year and grab our FREE adventure advent calendar printables below. You’ll also find a variety of kids’ ideas from handmade craft projects to adorable store-bought options. When I was in first grade, my parents went to Europe for three weeks. They returned at the beginning of December, and one of my gifts was an advent calendar. It was a prized possession. The calendar wasn’t filled with chocolate but beautifully designed. Each box had a small image of a toy behind the flap. That small & simple pleasure brought me great joy as a child. As an adult, I am always utterly disappointed by the chocolate filled advent calendars available for my girls. So, a few years back I bought a reusable felt Christmas tree advent calendar. This year our advent calendar is going beyond chocolate. I have been looking for a way to make our family advent calendar something truly memorable. We decided to do a calendar focused on family fun! I wrote a list of holiday activities to do with the kids and made printable “Holiday Adventure Cards.” I am excited to share the printables with you! Fill in the blank holiday adventure advent cards *So you can customize them! I recommend using cardstock or photo paper when printing, if possible. But truth be told, traditional printer paper works great too because you can fold the notes up! Click here to download must-see holiday movie advent cards, holiday activity advent cards or fill in the blank holiday adventure clue cards. Click the links below to open and then print your Adventure Advent Printables. Don’t have an adventure calendar yet? You’ll find some cute store advent calendars below along with a few ideas for homemade advent calendars too! Looking to buy a fun holiday calendar for your family? Below are a few of my favorite places to shop for Christmas countdown calendars. 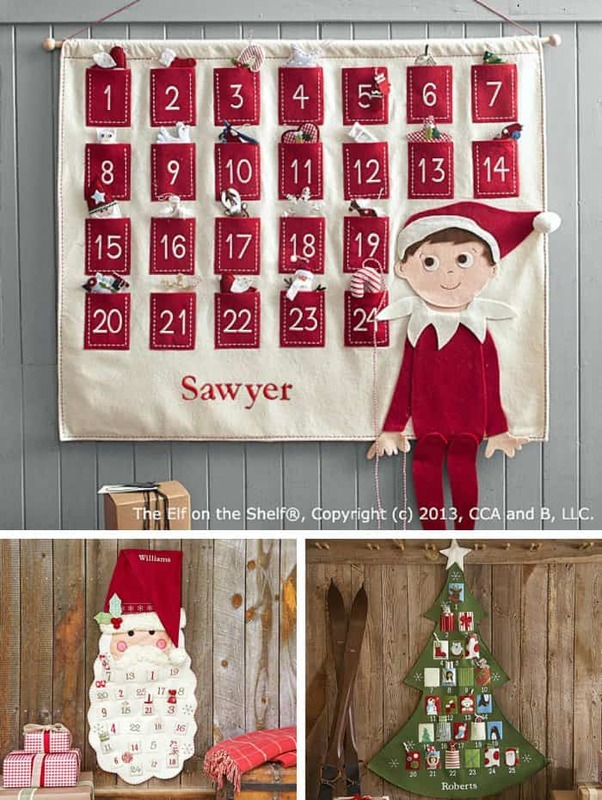 If you want to do a holiday adventure calendar, but prefer a homemade advent calendar, these DIY projects could be fun! Just write your daily adventure on the strips of paper when creating these kids’ projects! Looking for something in the middle — not from a chain store, but not homemade (by you!) either? 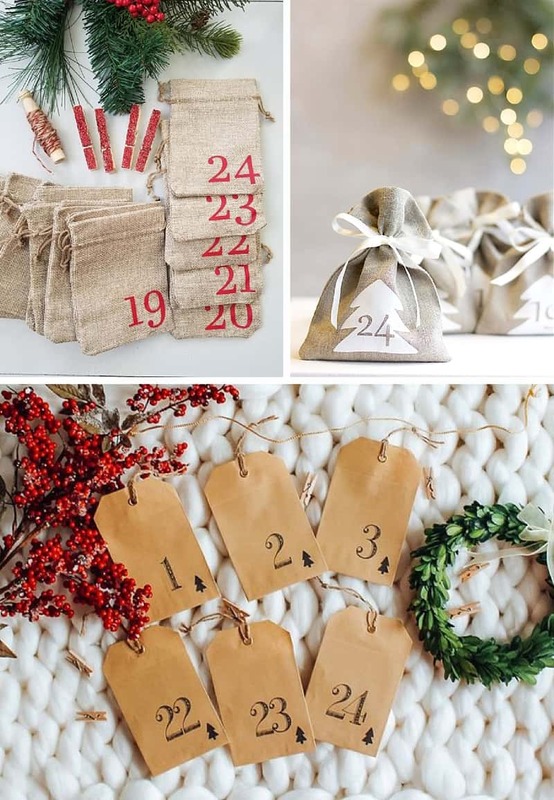 Etsy has some wonderful goodie bag options to use for your Christmas countdown. These three adorable options were featured at the start of the post! 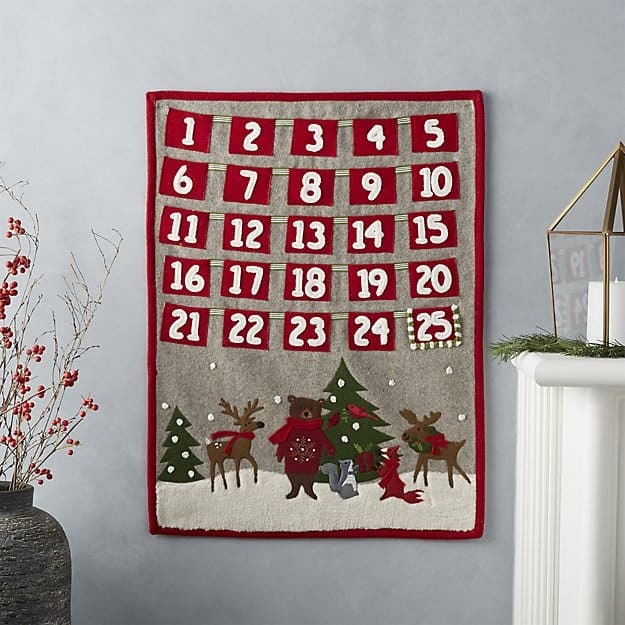 Don’t let buying or making a calendar hold you back from enjoying the pure joy of an advent calendar this season. I can guarantee you could grab twenty-five white business envelopes and write numbers on them with a red marker and your child will still be thrilled. So simple, so sweet. Wha-what?!!? 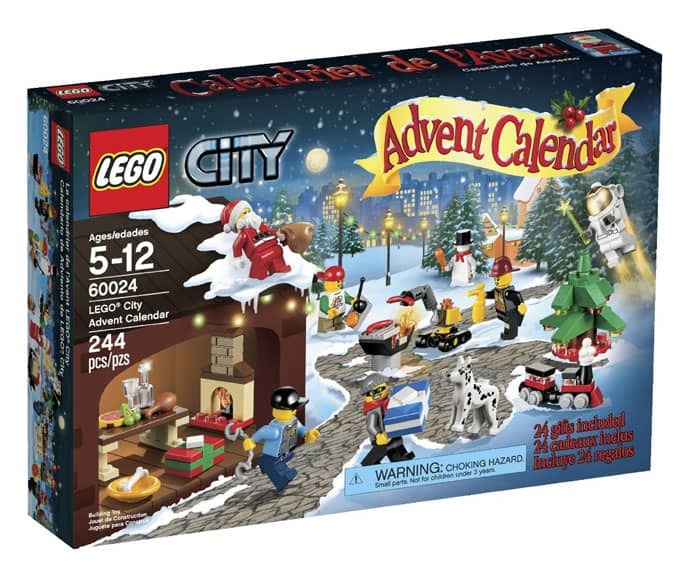 LEGO Calendars?!?! So neat. There are so many cool varieties! Sorry friends, it seems these goodie bags are no longer available. I hope you find the Etsy suggestions helpful! Thank you SO MUCH for featuring my advent calendar printables! Like I said on your blog in the comments, THANK YOU. I found other examples, but yours by far was the best. I am so proud to have discovered and share them with my readers! I am totally doing this! Thanks so much!! I am just giddy with excitement! We are going to use some of the “clue cards” to do math problems & also direct the girls to other bigger fun advent items like holiday books! Wow!!! Love it!! I love the idea of doing things with the family rather than eating chocolate!! I am having a bit of a problem downloading the activity cards…can you please help? Let me know if you still have any problems. It took me a while to figure it out, but I think it is fine now. Thanks for letting me know about the issue Kelly! I LOVE these! I’ve been looking for advent calendar ideas so I don’t have to come up with my own list this year. I’ve also been having trouble printing these; I can get the document to open in Adobe but it says it cannot print. ?? Could anyone ever get these to print?? Ladies, I updated the PDF and did my best to reduce the file size. Let me know if you still have problems! I am doing something similar. We have small stockings. Some will have some small trinkets, some will have a special activity planned (that they can redeem when they want) and the others will be missions they are challenged to complete for at least a day. Can’t wait to see if it turns out. Sounds wonderful, I’d love if you’d comment again at the end of the month and let me know how it goes! Hmmm. Frustrating! Let me try & take a look at it. Thanks for letting me know something was up ladies. A super big thanks for these ideas and printable cards, Zina! It feels SO good to be starting a new tradition in our new home, and that’s all thanks to you! Hooray! I am so happy you are diving into the adventure too. I cannot wait to watch Rudolph with our girls too. awesome! you are able to print the files now 🙂 thanks so much! these are just perfect. I am glad they are working! Where did you find those bags? We will be doing our 12 Days of Christmas using similar bags that my made for us — so I will be sharing the tutorial on how you can make them. They are SUPER EASY!! She makes them to use instead of wrapping paper or gift bags because they are reusable and she knows how much I love reducing waste. I love your activities! Finally getting into the holiday spirit here.